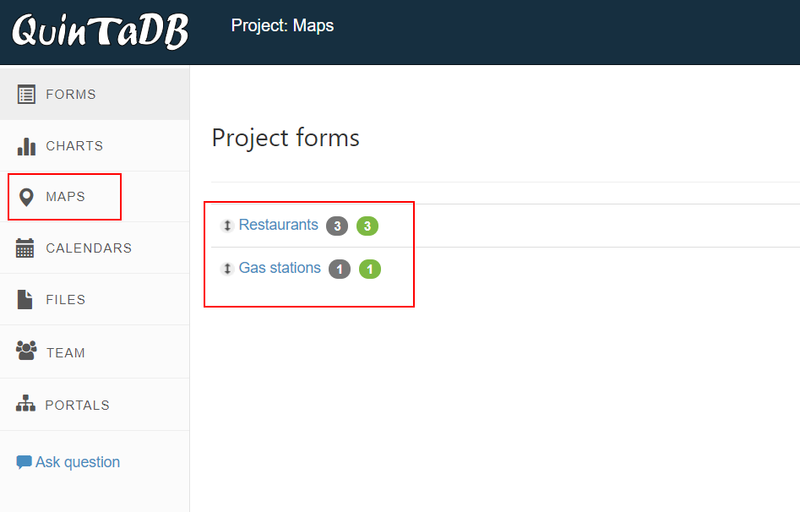 In order to create Map in QuintaDB you need the project with at least one form. Below our test project with several tables - Restaurants and Gas stations. Once you've entered your Map name on 'Maps' page you have to enter at least one data source. You can select both Table and Report as a data source. You have to select data column in which you store address or coordinates. You can configure the way your markers looks like on your map. You can select what to show when you hover on marker and when you click on it. You can upload your own marker icon or choose from which data column to fetch it. Here is how final Map page will looks like. You can integrate your Map widget in the same way you doing it with all other QuintaDB widgets. You can find integration code in 'Integration' tab. You can also set your map size, zoom and map center.